Happy New Year’s Eve! I started a tradition in 2012 when I posted our Favorite Moments in a “Best of” blog post. Well, it’s New Years Eve again, so it’s time to take a look back on 2015. This year was a great one, we celebrated 12 years together, released two new short documentary films, our films received over 240k views online, and we made a lot of progress on our debut feature film following the late artist Chuck Ramirez. From January through December, here are our top five favorite moments from 2015, enjoy! In May, we were selected by the DCCD as Creatives of the Month. It was an honor to be recognized and featured in their weekly newsletter Atmosphere. Read our full interview on GetCreativeSanAntonio.com. 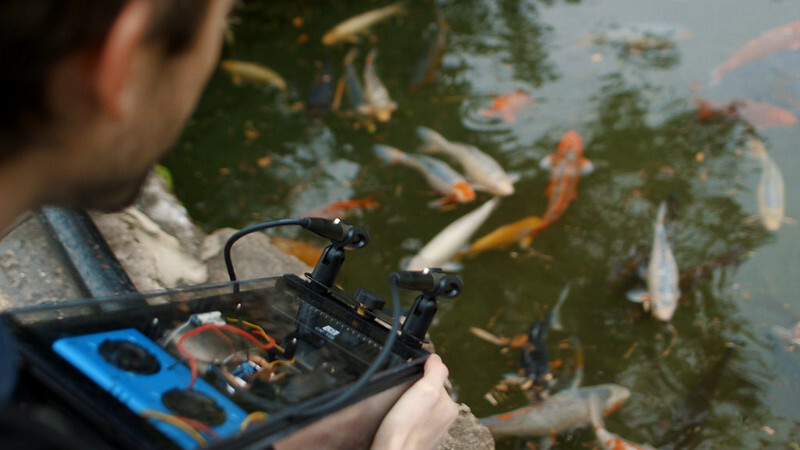 We couldn’t believe we made this amazing list of Vimeo Creators! Jason Sondhi, Sr. 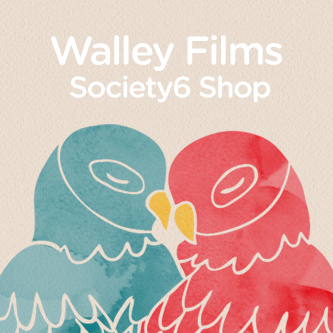 Manager, Curation at Vimeo said of our work, “Husband and wife creative duos are the epitome of cute. Amirite?? Texas-based, this couple has found their niche in creating delightful artist-profile documentaries. With a careful eye and effective interviewing style, they somehow manage to find that deeper layer in an artist’s work and manner, the space beyond the surface gloss so many profile documentarians get hung up on.” Thanks Jason and Vimeo for being such great supporters of our work over the years. Read the full article. 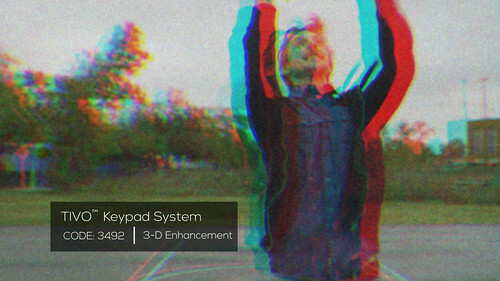 This summer we released a short documentary unlike any other we’d produced. The film follows the inspiring story of my young cousin Rueben. We followed Rueben as he battled encephalitis, a rare virus which causes seizures, and as he pursued his passion for basketball. He hopes to inspire others to never give up, no matter how difficult the circumstances. Watch the film. Read more in a previous Blog Post. In September we visited Rice Gallery in Houston for our 9th film in our series following their space for dynamic site-specific installations. We were absolutely floored by the beauty of Intersections by Pakistani-American artist Anila Quayyum Agha. The completed film received lots of attention online including our 10th Vimeo Staff Pick and features on Colossal, National Geographic Short Film Showcase, and The Atlantic Editor’s Pick. We loved working with Anila and following the story behind her work, thanks to everyone for watching and sharing! Watch the film. Those are some great memories to look back on, thanks for reading and watching. Here’s to a productive and inspiring 2016! Last fall we were invited by curator Hills Snyder to create an exhibition at artist-run space, Sala Diaz. We knew that we wanted to take the opportunity to step outside of our comfort zone and create work that was more than just video. After weeks of brainstorming, Mark came up with the idea of inventing an impossible camera. His idea would challenge us to build a camera sculpture, but allow us to stick to our strengths designing poster artwork and producing videos to promote the completed camera. We discussed how to approach the camera and then began coming up with features it would ideally include. 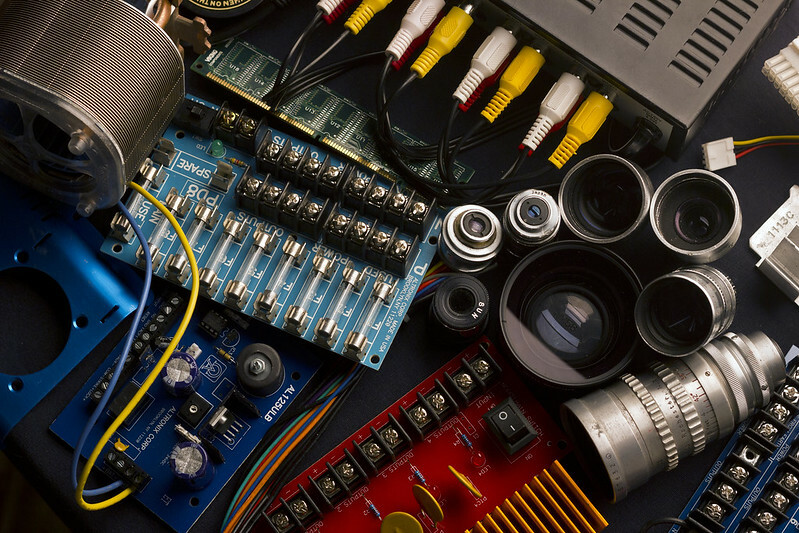 We began by collecting materials we owned, such as a broken handy cam, LED light, microphones, and vintage camera lenses, before visiting recycling centers and resale stores for low price electronics. We had a lot of fun rummaging through our local recycling center for visually interesting computer parts. Another great resource was Havel Camera Repair Services, who gave us a box of scrap camera parts to use. After collecting all our materials we spent time tearing them apart, matching the pieces to camera functions, and designing how all the parts would all come together. 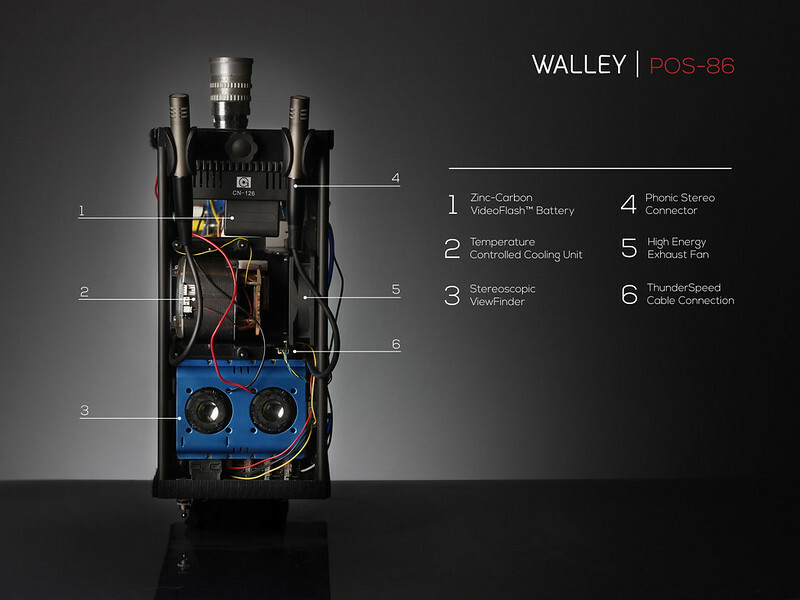 The main body of the camera is an old computer tower which we painted black and filled with found electronic parts. Angela’s favorite aspects of the camera are the ones that are subtle but took a lot of time to get right. There is a red light ON indicator and QuadOptic™ Lens Switcher that she made “function”, meaning the light turned on and the buttons pushed in. 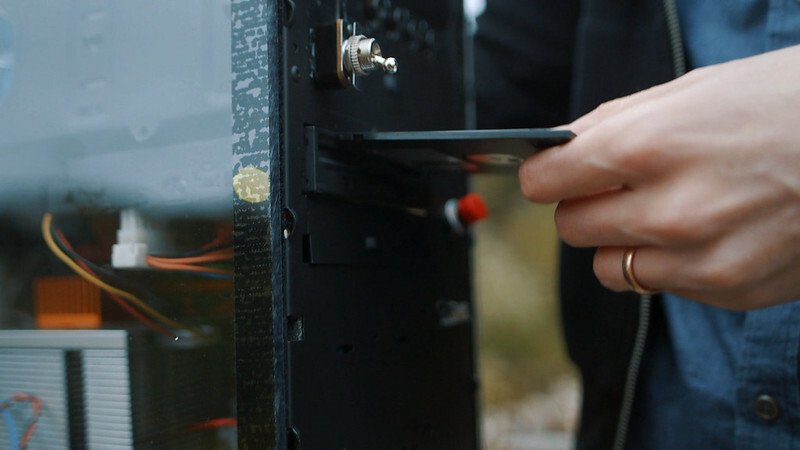 There is also an 8-pin Retractable Transfer Cable that actually retracts, a record button you could press, and a Power ON / OFF Toggle Joystick you could play with on the back of the camera. 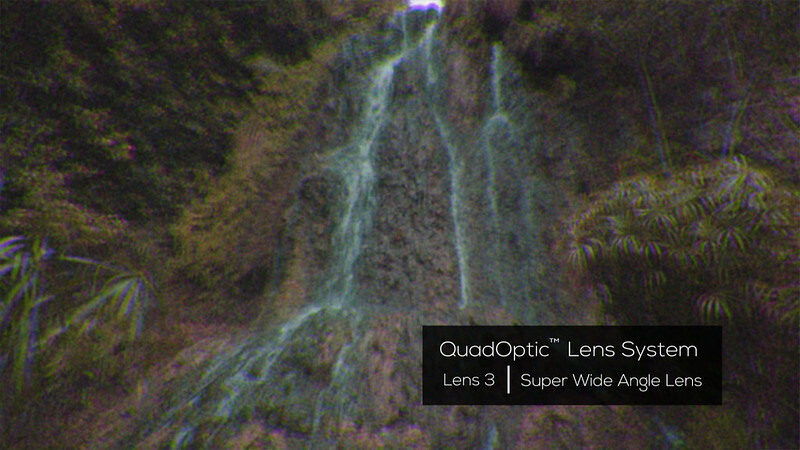 These details weren’t featured in the completed promo video, but they made the camera feel more “real” to us. After spending two weeks inhaling adhesive, we had the majority of the camera completed. With help from Mark’s brother, we attached our four 8mm camera lenses to the front the camera. The lenses suddenly made a computer tower a believable camera. Since the camera was near completion, we started writing our promo video script. After watching a series of Apple promo videos, we knew we needed a combination of cool guy and technical guy to sell our camera. 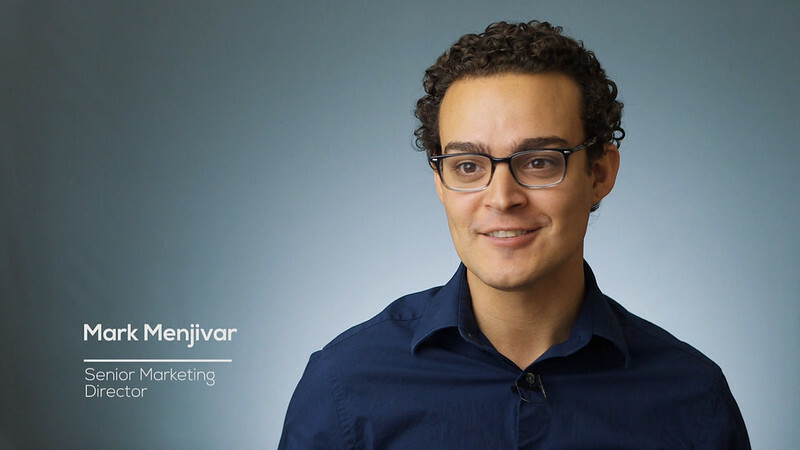 Our friend, artist Mark Menjivar was the perfect for the role of “Senior Marketing Director”. Mark knew exactly what we were talking about in terms of delivery and enthusiasm. As a professional photographer, we’re sure he is very aware of the endless production and marketing of cameras. He kept us laughing throughout the entire “interview”. Next we needed the perfect couple to demonstrate the power of the camera. Our friends John Totman and Sara Frantz fit the role perfectly. Sara and John let us chase them around the Japanese Tea Gardens on a rainy, cold afternoon. The public park gave us a beautiful backdrop for our film. We had access to a large open-air pagoda, exotic vegetation, sprawling koi ponds, charming bridges, and a picturesque waterfall. Our second location was Roosevelt park which gave us access to a public basketball court and playground. Those scenes were written so the audience could see just how versatile and fun the camera is. Our third location was Sara’s home studio. (Check out Sara’s incredible artwork on her portfolio site). We hadn’t completely planned the scene, but the natural lighting and space worked out perfectly. 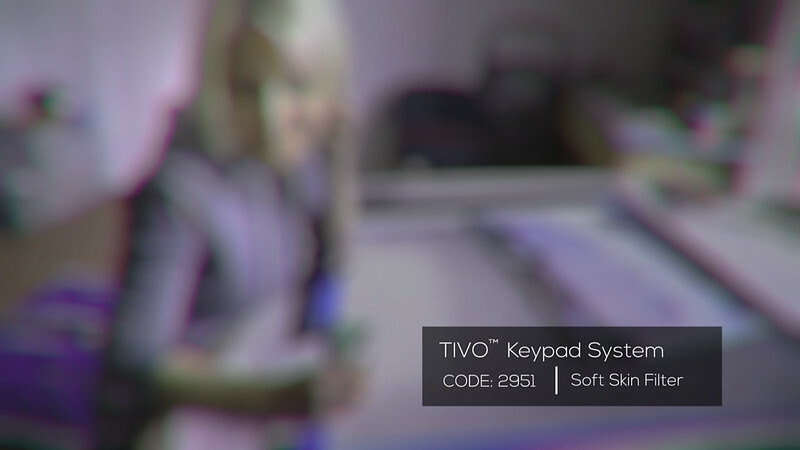 It gave us a chance to feature one of our favorite aspects of the camera, the TIVO™ Keypad system. 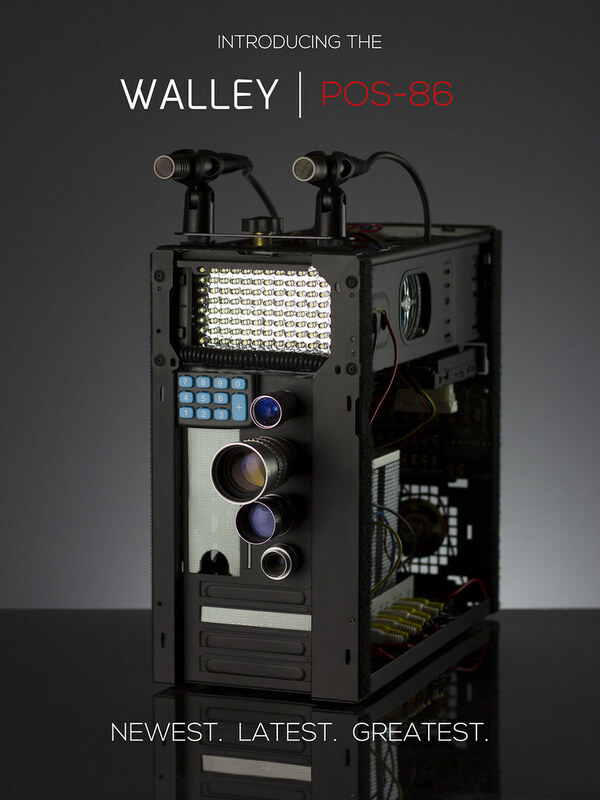 The ideas behind this project were inspired by Mark’s research for our most recent camera purchase, the Canon C100. 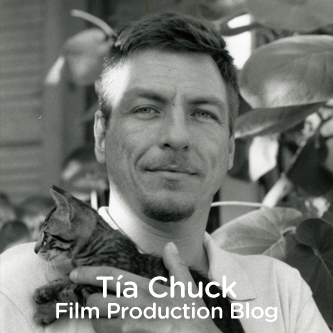 There is a whole world dedicated to the technical side of filmmaking that can become overwhelming. Technology has made our work possible, but at the same time, we feel that story telling is the most important aspect of our work. Yes, the technical specifications of products and productions are important, but making work that you believe in should always come first. Our exhibition at Sala Diaz was entitled “Creation to Consumption” and ran from December 13th, 2013 – January 17th, 2014. We had a wonderful reception and enjoyed some great feedback from the San Antonio art community. 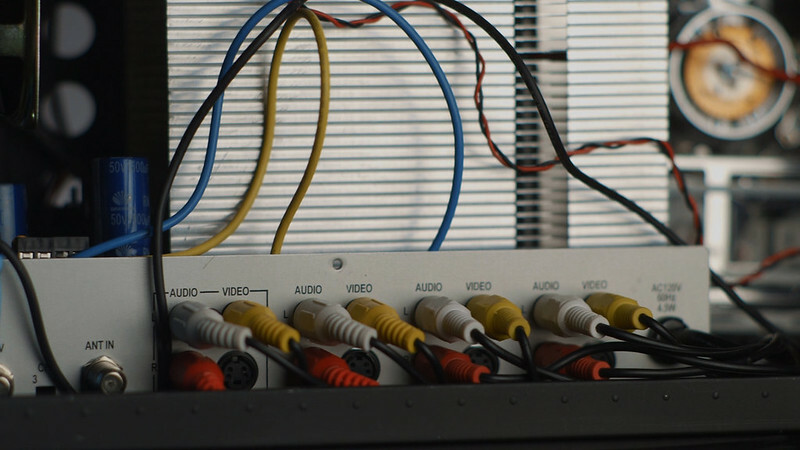 Filmmakers Mark and Angela Walley dive into the worlds of video camera invention and commercial marketing for their upcoming exhibition Creation to Consumption at Sala Diaz. 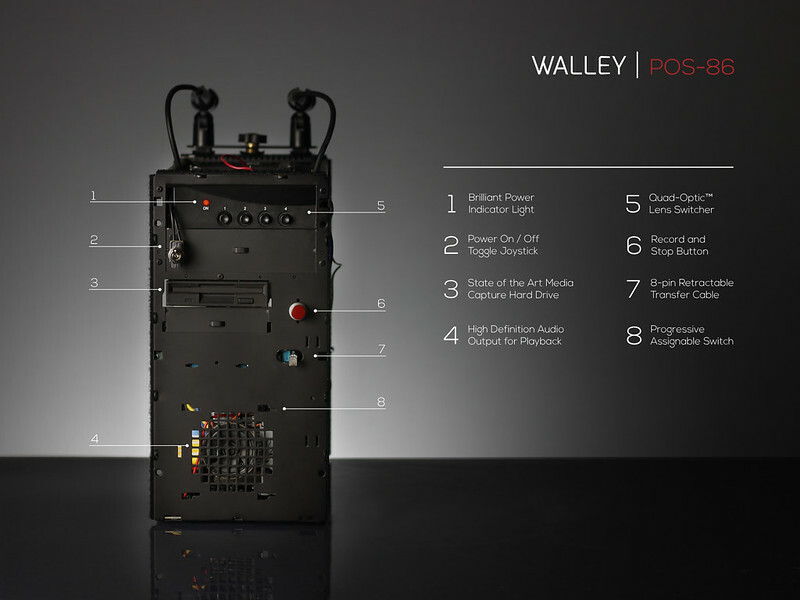 The gallery space will be transformed into a product showroom to unveil and demonstrate the WALLEY POS-86, an impossible video camera that represents a reverse trend in consumer electronics. Through the use of sculpture, video, and design, Creation to Consumption satirizes the seemingly interminable production and distribution of new retail electronics. 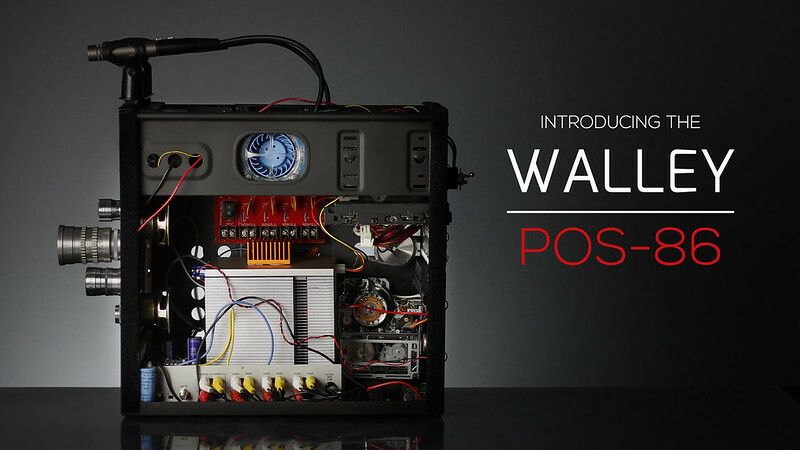 Two days ago, we released the WALLEY POS-86 Promotional Commercial. The film has already been featured on Vimeo Staff Picks, No Film School, FStoppers, Cinescopophilia, Premium Beat, and Studio Daily. We’re so grateful to be part of such a supportive online creative community. Thank you to everyone who has watched, liked, shared, and commented on our video! 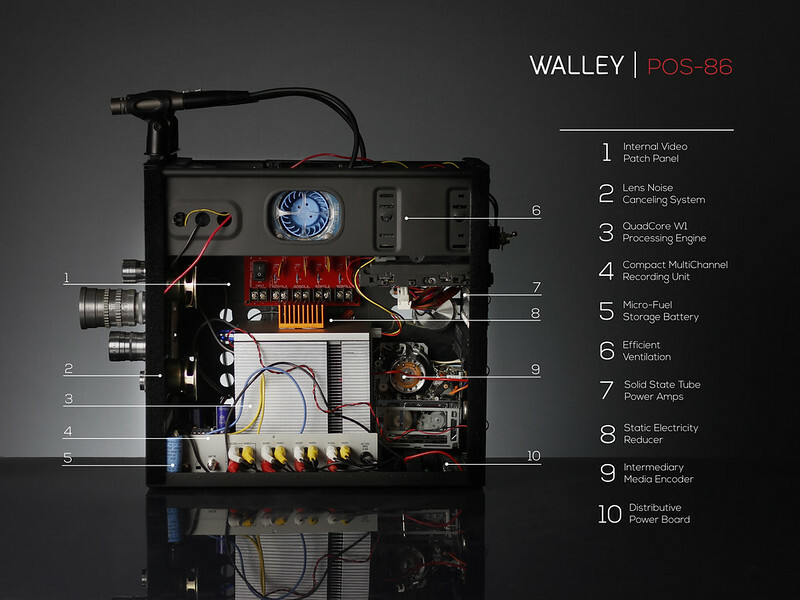 Check out more images on our WALLEY POS-86 Flickr Album.